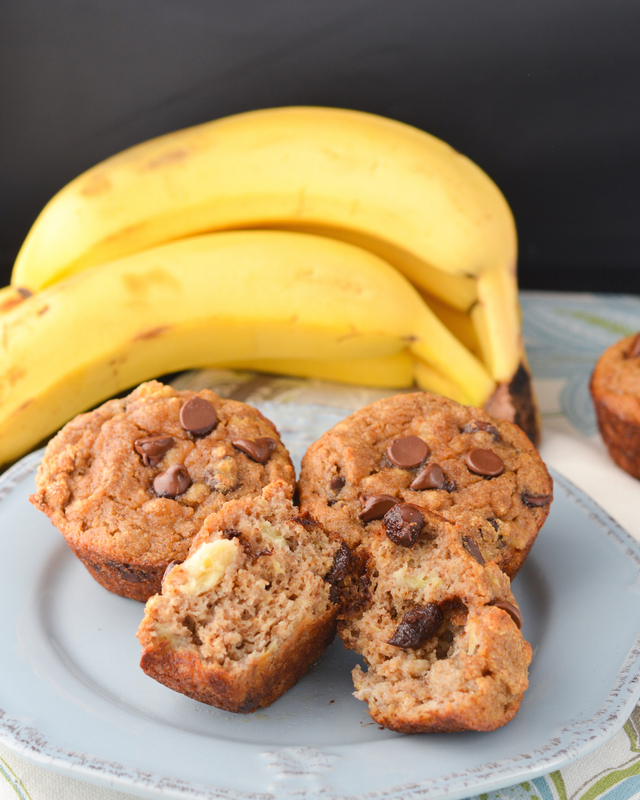 These Coconut Flour Banana Bread Muffins are gluten-free and packed with chunky banana and chocolate chips! They are perfect for breakfast or as a snack with a warm cup of tea! It’s mid-January already. HOW!? Seems like yesterday it was August and we were packing up Nick’s stuff for deployment. And now homecoming has come and gone, the holidays have come and gone, our vacation is already a distant memory, and it’s back to the grind. Back to “normal” life. But that’s OK… that means lots of cooking at home and healthy meals. And lots of packed lunches and snacks. One of my favorite easy-to-freeze snacks to pack is muffins! And not big, sugary muffins. But muffins packed with lots of healthy stuff. I know, I know. There are chocolate chips in these muffins. But those are just for fun. These muffins are also packed with bananas and lots of healthy fats and fiber from coconut flour and coconut oil. They’re super delicious but will stick with you as a hearty breakfast or snack. I love baking with coconut flour because it has such great flavor and a totally unique, moist texture. If you haven’t tried it, this is a great recipe to start with! You’d never know these muffins are kinda healthy. In fact, I love having one or two for dessert as well! I mean, hello, chocolate. You can never go wrong with chocolate. And these little muffins with quiet your sweet tooth without gorging on a pint of ice cream (I know I’m not the only one who wants to do that!). Preheat oven to 375 degrees. Spray 9 muffin cups with nonstick spray and set aside. In a large bowl, whisk together coconut flour, baking soda and powder, salt and spices. In another bowl, beat together eggs, banana, honey, coconut oil and vanilla extract until smooth. Pour the wet ingredients into the dry and stir until just combined. Fold in chocolate chips. Pour batter into 9 sprayed muffin cups. Bake 18-20 minutes, until edges are just browned and a toothpick inserted comes out clean. Let cool in muffin tins about 10 minutes, then transfer to a wire rack. Serve immediately or store in an airtight container in the fridge. Check out these other great coconut flour recipes! I can’t believe it’s January either! I feel like it was just LAST January and we started 2015! 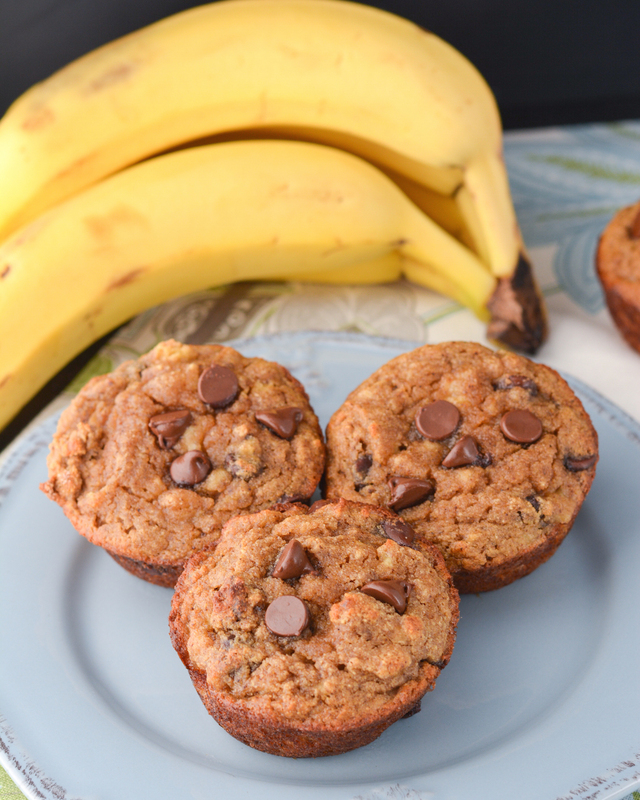 I can never resist anything with bananas, so I’m loving these muffins! I’ve never baked with coconut flour before, so i definitely need to start. Love this easy recipe! I agree, it feels like no time at all has passed! But there is something nice about getting back into the routine after holidays that I kind of enjoy. These muffins look so delicious! They’d be perfect for a coffee break snack! I’ve been wanting to try baking with coconut flour and this recipe looks great! I will have to give it a try! Banana bread is a weakness of mine… along with muffins. So anytime you can put two things I love together, I swoon! These muffins look delicious and the addition of chocolate chips just sounds wonderful! Plus I LOVE that you used coconut flour! NEED about a dozen of these fabulous muffins! Cheers! I haven’t tried baking with coconut flour yet but now I really want to try! 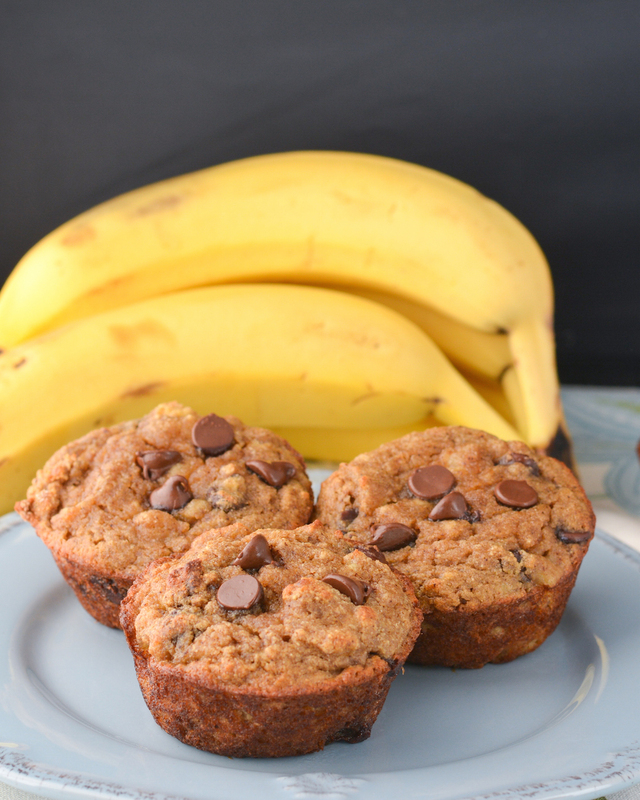 These muffins look perfect for breakfast, I love a healthy banana muffin in the morning. The perfect breakfast! I love baking with coconut flour!! These muffins look so delicious – I wanna make these to have for breakfast this weekend! I’ve been meaning to try out coconut flour but I’ve been afraid haha I’ll start with these muffins! Time is just flying this year so far – I feel like the holidays (and all that sweet vacation…) was forever ago! Coconut flour is soooo yummy… you definitely need to try it! Thanks, Alyssa! about 3 Tblsp. left in my jar of honey. Used 1/2 cup chocolate chips. They are plenty sweet for me. Glad you liked them!! Thanks, Ellen! Made these muffins last night, using a few small bananas that I had that were very overripe. So I did not use any honey, and put in a bout 1/3 cup of mini chocolate chips. Delicious! I have been looking for recipes that call for coconut flour, and I am happy to have found this one. Thank you! Thanks Anna! I have a few other coconut flour muffin and donut recipes on the site– check them out by putting coconut flour in the search bar! 🙂 I love experimenting with it! These muffins are absolutely delicious!!!! Thank you for sharing! SO delicious. Just gobbled one up fresh out of the oven. I made a bunch of mini muffins, perfect sized treats for my little ones. Also, only added one tablespoon of honey. They’re so sweet and delicious! I made these this morning and already ate one and wanting another. Our bananas weren’t totally overripe but they worked out just fine. I decided not to use the total amount of honey, maybe 1/2 the amount and added unsweetened coconut milk for added liquid, which cut down on sweetness. Then in place of chocolate chips, I added same amount of chopped pecans. Great recipe! These are amazing!! Finally a gluten free muffin that is moist without being too wet. Thank you so much! Wow, these had way too much nutmeg/cloves for me! I made a double batch, hoping I would love them, and I wondered about the amounts for the spices and thought about changing them, but decided to follow it as is the first time. Next time I would definitely do half the amount, or even a quarter of those two spices, and maybe a little less cinnamon too. I did adjust the recipe to 6 eggs and added in an extra banana, and the texture seemed to come out fine, albeit a tad spongy. Does anyone know the macro breakdown of these muffins? How many carbs are in them? Thank you so much for such and amazing recipe! I prefer baking with coconut flour but find it hard to find good recipes that don’t require a million eggs and a product that is too mushy. This recipe was perfect, I was even able to make a few modifications. Thank you again! This sounds great! I am new to using coconut flour and I am also trying to do low sugar for my diabetic husband. Do you know how much Swerve to replace the honey? These are my new favourite muffins – so moist and tasty. I put raisins in and they were delicious. Hi. I made these banana muffins, it was delicious! The only thing I didn’t add was the honey, Thamks for sharing! How many Calories are in one muffin? These were so easy to make and delicious! I used a mini cupcake pan instead and added walnuts to the entire batch and chocolate chips to half. They are almost all gone already! Thank you so much!